It's Holi fervor time which of course is incomplete without colors, but the cheap colors are made of harmful chemicals like lead, glass pieces etc. In ancient times in absence of chemicals people celebrated the festival with colors made naturally. These herbal colors posed no threat the the health. Ahead of the festival of colors, The markets are brimming with an array of colors in the form of gulal, dyes and sprays. But What's Holi without colors? These colors can cause dermatitis which results in 24-hour itching, subsequent rashes and swelling. These heavy metals, synthetic colors and dyes used for making colors can cause eye problems like corneal ulcer, conjunctivitis and trigger allergy in which the pus maybe formed and a person may be rendered totally blind. Colors in the form of pastes have toxic compounds mixed in a base of engine oil or other inferior quality oil, capable of causing skin allergy, temporary blindness. The chemical colors came into vogue as they are convenient and cost effective options against the natural colors for makers. These days they mix harmful chemicals in colors and play with the health of the consumers for the sake of profit. The chemicals added by them are so injurious that if unfortunately they enter a human body, they may cause fatal infections. How are colors synthesized chemical? Shiny colors are a result of powdered glass being added to the colors. Green color is obtained from copper sulphate -which may cause allergies in eye or even temporary blindness. People must realize that the colors have been added to Holi to make the festival more joyous and enjoyable and not to cause inconvenience to others. So, next time you play with colors use good quality or natural colors and play according to the convenience of others. For orange: Dip 500 gm tesu flower in 10 liters of hot water for 12-15 hours. It should ideally be done a day before Holi. For blue: Grate beetroot and black carrot and dip them in 10 liters of hot water for 12-15 hours. This should also be done a day prior to Holi. For pink: Dip 500 gm rose petals in 10 liters of hot water one day before the Holi. It is then ready to use on the festival day. For red: Powder dry red hibiscus flowers and use them as gulal. You can also soak these flowers in water overnight to get wet color. For green: Mehendi only leaves behind its color when it's wet and dry Mehendi can be brushed off very easily, so this can be used as an option for green. Leaves of Gulmohur (delonix regia) can also be dried and powdered to attain a fine green color. Holi is definitely a time to let loose and enjoy the company of family and friends to the hilt. So, make this festival even more exciting and safe with organic colors. 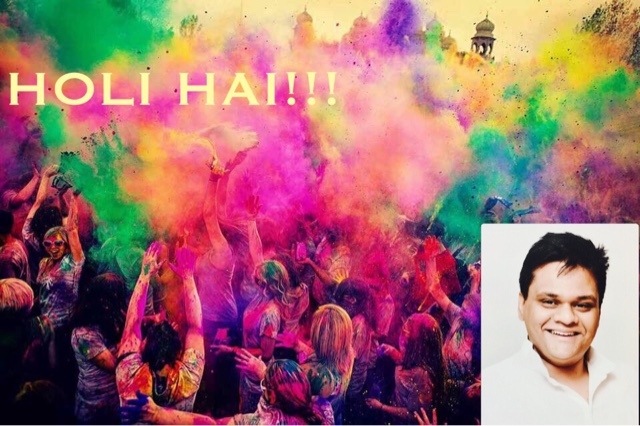 You would not want to visit a doctor after the festival would you so be safe and play a colorful yet safe Holi. Enjoy!